Lithographic Printing Chemicals Market size will likely surpass USD 17.5 billion by 2025; according to a new research report by Global Market Insights. Rising demand for newspapers and magazines in Asia Pacific countries will be the key growth enabler for the lithographic printing chemicals market. In 2017, India had more than 335 thousand paid-for and free dailies in circulation whereas China had around 150 thousand. These two countries have witnessed steady increase in the circulation of dailies in recent years. 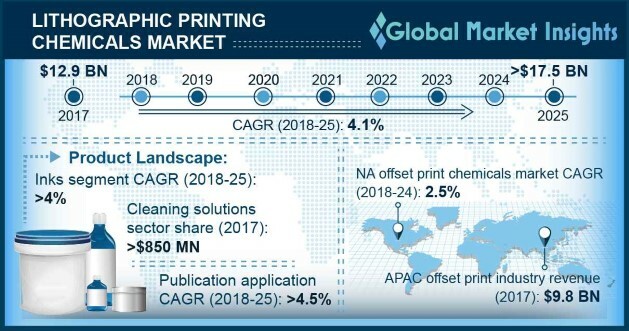 This trend will have a positive affect on the offset print chemicals market development as the products are extensively used for printing publication materials. High growth in the packaging industry will also propel the lithographic chemicals market development as the product is used in the printing process of packaging materials, mostly labels. Packaging industry growth has been mostly fueled by increasing international trade and e-commerce activities. The global packaging industry was worth more than USD 800 billion in 2017 driven by high growth in Asia Pacific. The U.S., China, Japan, Germany, and India are the largest packaging markets in the globe. Thus, increasing usage of packaging materials such as labels, cardboard boxes, folding cartons, etc. which are commonly printed using offset technology will propel the industry growth. Increasing usage of digital print technology will hamper the offset print chemicals industry development in the forecast years. In 2017, digital printing accounted for more than 15% of the global print market value and around 3% of the volume. Ease of customization, better quality print, and flexibility regarding substrate material are the key factors driving the digital printing industry growth. This trend is likely to hamper the offset print chemicals market as digital technology will gradually substitute offset technology in the future. Fountain solutions, inks, and cleaning solutions are the major product types in the lithographic printing chemicals market. Fountain solutions are a water-based mixture specially formulated to dampen offset printing plates before they are contacted by the inking rollers. A typical fountain solution will contain a natural or synthetic gum, an alcohol substitute, and other essential ingredients. Fountain solution segment is likely to generate revenues exceeding USD 3.5 billion by 2025. Packaging, publication, and promotion are the key application segments in the lithographic printing chemicals market. Packaging is a key application segment which is likely to grow by around 4% CAGR from 2018 to 2025. Increasing demand for labels, cartons, cardboard, and paperboard packaging materials will supplement the packaging application segment’s industry growth. Europe lithographic printing chemicals market value is likely to reach USD 1.7 billion by 2025. Significant volume of newspaper and magazine circulation in Germany, France, UK, and Russia will propel the regional offset print chemicals industry growth. Product usage for packaging applications is also likely to rise in Europe during the study period. Print advertisement industry growth will also positively influence the European offset print chemicals industry. Some key offset print chemical manufacturing companies include Toyo Ink Company, T&K TOKA Corporation, DIC Corporation, Flint Group, TCI Graphics, Sakata Inx, Siegwerk Druckfarben, Tokyo Printing Ink Company, Huber Group, SICPA Holding, FUJIFILM, Daihan Ink Company, etc. Apart from the large multinational players, many small and medium scale local manufacturers are also present in the lithographic printing chemicals market.